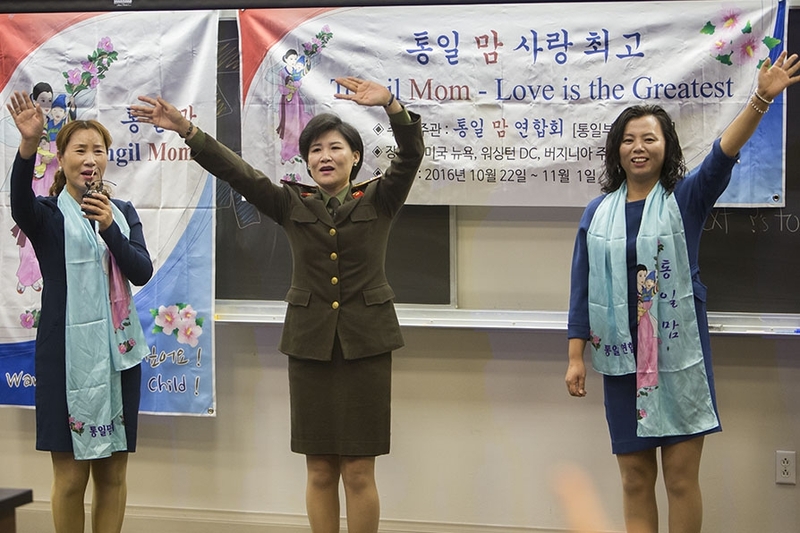 Tongil Mom, a group comprised of North Korean refugee women working to be reunited with their children, visited the University this past Tuesday to speak with the student human rights advocacy group, Liberty in North Korea. “The main point of this event [is] so that students can meet North Koreans and learn about their experiences from their own perspective,” Cameron Hicks, fourth-year College student and executive board member of Liberty in North Korea, said. Hicks said she wanted the event to challenge students’ preconceived notions about North Korea. Hicks said she hoped attendees would leave with compassion for the struggles North Koreans are overcoming. With the help of a Korean interpretor the women of Tongil Mom shared personal testimonies of how they defected from North Korea, their time in China as forced brides and how they eventually resettled in South Korea. Many North Korean women leave their country due to intense struggle and relocate to China, where they are often sold and forced to be brides for Chinese men. While these North Korean refugee women have children with these men, many are still forced by the Chinese government to go back to North Korea. This forced repatriation causes many women to never see their children again. Each woman who spoke at the event currently has a child in China from whom they are separated. “I felt that we needed to come together and tell the world about the situation of these children left behind in China and also to visit different places, to come to the U.S. and meet people like you at U.Va. to raise awareness, generate interest and get your help to work on this situation together,” Tongil Mom member Lee Young Hee said. Tongil Mom has three main parts in its petition, which is directed to the governments of the People’s Republic of China and the Republic of Korea. These include calling for proper identification papers for children born to North Korean refugees in China, humanitarian measures for mothers who defected from North Korea to be able to exercise rights as birth mothers to their children and giving these children the right to choose with which parent they live. The group is asking for the right to meet and spend time and be reunited with their children, Tongil Mom Executive Director Kim Jeong Ah said. “Obviously, the Chinese government is not going to stop its policy of repatriation overnight, but I believe if we approach the people in China, the people with a [conscience], the people who believe in human rights in China and if we approach this using social media then we can definitely try to make a change regarding the situation,” Kim said. The Tongil Mom members urged students at the event to like their Facebook page and to spread their message. To be able to to do their work — which includes speaking tours and surveying women’s stories — the group needs funding, but so far has not received any from the South Korean government. Correction - This article incorrectly referred to the Koran interpreter as a North Korean translator. Additionally, China attempts to send the women back to North Korea, not South Korea, as the article previously stated. 북한 자유 운동 단체인 학생 인권 옹호 단체와 대화하기 위해 대학을 방문했다. 배울 수 있도록 하는 것 입니다"라고 북한 자유주의 대학생이자 집행위원 Cameron Hicks는 말했다. Hicks는 이 행사가 북한에 대한 학생들의 선입견에 도전하기를 원했다. 쉽다고 생각합니다" 라고 Hicks는 말했다. 다루고 있고 그들을 지지하기 위해 노력해야 한다"
Hicks는 참석한 학생들이 북한 사람들이 겪고 있는 고통에 동정심을 갖고 돌아가기를 바란다고 말했다. 그리고 그들이 한국에서 어떻게 정착했는지에 대한 증언을 들었다. 중국 남성들의 신부가 되기를 강요 받는다. 이들 탈북 여성들이 중국인 남성들과 함께 아이들을 낳았지만, 중국 정부에 의해 강제 북송 위기에 쳐해있다. 중국에 강제북송으로 많은 여성들이 아이들을 다시 볼 수 없다. 이 행사에서 연설한 여성들은 현재 중국에서 그들이 헤어진 아이가 있다고 했다. 만날 필요가 있다고 느꼈습니다" 라고 통일맘연합회 회원 이영희씨가 말했다. "북한에 관한 인식을 높이고 관심을 갖으면 이 상황을 해결하는데 도움이 됩니다." 통일맘연합회는 중국과 한국 정부를 겨냥한 3개의 주요 내용을 담고 있다. 권리를 행사할 수 있도록 하는 인도적 조치, 그리고 이들에게 부모와 함께 살 권리가 포함된다. 통일맘연합회 김정아 대표는 통일맘연합회가 아이들과 재회할 권리와 시간을 보낼 수 있는 권리를 요구하고 있다고 말했다. 소셜미디어를 통해 이 문제 접근하여 변화를 시도할 수 있습니다"라고 말했다. 통일맘연합회 회원들은 이번 행사에서 학생들에게 페이스북 페이지 좋아요를 통해 자신들의 메시지를 퍼뜨릴 것을 강조했다. 많은 여성들의 이야기들을 조사하는 등의 일을 할 수 있으려면 자금이 필요하지만 지금까지는 한국 정보로부터 어떤 것도 받지 못했다. "우리는 중국에 있는 어린이들이 그들의 어머니의 소재를 찾아보기 위한 웹사이트를 만들고 싶어요"
"우리는 많은 어머니들을 재결합시켜 아이들을 다시 안아줄 수 있는 많은 아이디어를 가지고 있습니다. 라고 김정아 통일맘연합회 대표가 말했다.